It seems there is no stopping for Aamir Khan starrer 'Dangal' and it has added another feather in its cap of glory. According to a latest report by Forbes, 'Dangal' has become the fifth highest grossing non-English film ever in the history of cinema worldwide. 'Dangal' as of yet has earned 1930 crores worldwide. A proud moment for our nation, isn’t it? According to the Forbes’ report, global ticket sales of the Nitesh Tiwari directorial venture have crossed the coveted $300 million, with $179.8 million in China alone and $84.4 million in the home country. Only four other non-English films have ever managed to surpass this feat-China’s 'The Mermaid' ($533 million) and 'Monster Hunt' ($386 million), France’s 'The Intouchables' ($427 million) and Japan’s 'Your Name' ($354 million). According to Forbes if the film continues to perform like this way, it would be no surprise if it surpasses the four films mentioned above. 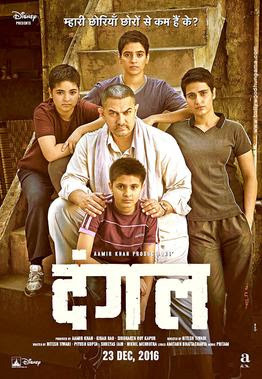 In China 'Dangal' released on May 05 as 'Shuai Jiao Baba' that translates to 'Let’s Wrestle Dad'. Just a few days ago, Chinese president Xi Jinping had praised the movie to Indian Prime Minister Narendra Modi. The film has been accepted everywhere and is earning applause and praises worldwide. Dangal is about a never-giving-up father Mahavir Singh Phogat who trains his daughters to wrestle and they eventually participate in the international matches. Aamir Khan’s role has already earned him a Filmfare Award for the Best Actor and no denying he is going to earn more laurels now.